The Common Snapping Turtle is one of two species of a genus that ranges across North America, from southeastern Alberta to Texas, and continues west to New Mexico and south through Central America to Ecuador. 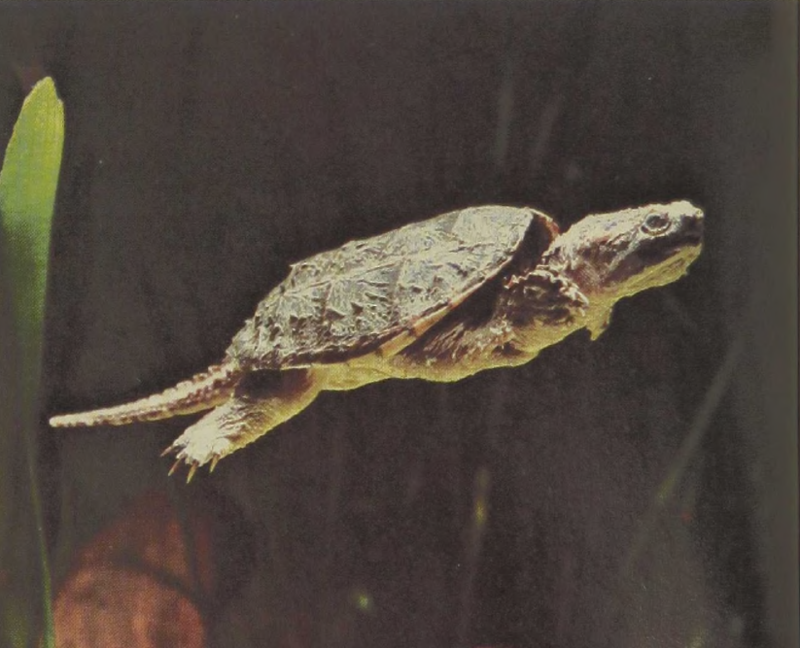 Snappers have a shell length of up to 19 inches and may reach a weight of more than 28 pounds. In contrast to the Alligator Snapper, this aquatic species is a good swimmer and an active predator. While it will take carrion, it subsists on practically all aquatic animals as well as many kinds of water plants. This omnivorous habit probably accounts for some of the animal’s success, as does its ability to move freely on land, a walk of more than five miles having been recorded. Walking may be facilitated by the ventrally wide-open shell, which allows the legs more freedom of movement than in many other turtles. Snappers tend to be much more aggressive when surprised on land than when they are approached in the water.